Equi-Trek Horse Vans by L & D Trailers makes it possible to drive WITH your horses! Our Rear Wheel Drive and Dual Wheels with Sway Bars add incredible stability and security. Big enough for 18 hand horses! With Equi-Trek, Your Horse Trailer and Truck Become ONE, Just like Europe! What an advantage, and what a comfort to your horses to see the owners they love and trust, right in the van where they can talk to, keep an eye one, and comfort them during travel! Many trucks (like the F350) are close to $70,000 and then, a good horse trailer can be $20,000- $60,000 more! With Equi-Trek, you can have our Horse Vans right around the same price as just the cost of a good truck! What a huge advantage— and savings— for horse owner and what an increase in comfort and security for your horses! Tired Of The Stress and Worry About Hooking Up A Trailer? Imagine, NEVER having to HOOK your trailer up to your truck! Especially in emergencies such as an ill or injured horse— or even fire or flood! Valuable, life-saving minutes can make the difference between life and death in times like these! We all know the frustration of hooking your truck to the trailer properly… and if you are under pressure or upset, it can be a nightmare! How about never having to wonder if your trailer is property attached or has come loose during travel? If your horse becomes upset during loud traffic, wouldn’t it be nice to offer soothing words, turn on the radio and pass over a carrot? The Equi-Trek HorseBoxes are setting NEW standards when it comes to safe travel with your horses! What Is The History Of Equi-Trek? Founded in Yorkshire in 1999, Equi-Trek is the largest HorseBox manufacturer in the UK. This has been achieved through their in-depth understanding of the requirements of both the horse and rider because the makers of Equi-Trek HorseBoxes have successfully competed in a variety of equestrian disciplines at international level for many years! This knowledge and experience, coupled with their amazing selection of options with 2 sizes of horse boxes make Equi-trek LTD the Choice of Champions! How Did The Equi-Trek Horse Vans Get To America? Yes, with bringing them to America, we have decided to call them “Horse Vans” rather than the English term “Horse Box”… So you know, it took some ingenuity, determination, and, frankly, a tremendous amount of work by dedicated horse owners Lynn and Dan Roberge! A few years ago Dan attended a dressage in Wellington, FL – and saw a Horsebox in America for the first time. He was so excited, that he rushed home to tell his wife, Lynn, all about it. She was delighted to know that there was an option available to having to hook up a horse and trailer and that they would be able to travel WITH their horses –so they decided to look into current HorseBox manufacturers around the world and found Equi-trek LTD in England…after many trips to England and talking and considering many vehicle manufacturers, Dan and Lynn, through much research and trial, have decided that the Ford Transit offered the best quality, durability and workmanship—and so a partnership was formed with FORD and a Equi-Trek Portland, through their parent company,“L & D Trailers”, was born! Why Do The Horses Face "Backwards" In Our Horse Vans? Traveling backwards is better, safer and preferred by most horses! A study examining the response to travelling forwards or backwards during a one hour journey showed a significant decrease in heart rate in the horses traveling backwards. These horses also tended to rest more often on their rumps in maintaining their balance. This “buttress” posture adaptation is commonly exhibited during grazing, whereby the shoulder provides better lateral support than the rear legs. Often, the rear legs engage in a side stepping action when responding to lateral pressure, such as experienced in a trailer navigating a sharp corner. The forward facing horses held their heads in a higher than average position and also moved more frequently due to difficulty in balancing. Interestingly, the forward facing horses vocalized more frequently. Heart rates increased at loading and unloading, and decreased during the journey as the horses became accustomed to the motion of transport. Do Our Horse Vans Cost About The Same As An F350 Truck? Yes… very close! The cost of your VISION HORSE Van is about the same of a new heavy duty Pick-up Truck- With Our Amazing Horse Vans starting at $69,999 to $85,000 with many options- The VISION is engineered to transport your horses on a one ton dually chassis, rear wheel drive. And toll road fees are less when you travel. What Are The Advantages Of Having Your Horse Ride With YOU-- Instead of Behind In A Trailer? Honestly, there are so many advantages, the greatest of which is ‘peace of mind’ that it is hard to think of them all, but here are a few! * It is developed to ensure the safety and comfort of your horse through rear facing travel. which studies have proven to be the safest and most comfortable direction of travel for equines. * Horses load via a side ramp which allows the rider to guide the horse whilst loading. before the ramp is closed. * No “hitch up” time or worry! * No worry about trailer brakes or lights—because there is no trailer! Is It True That All Our Horse Vans Are Built On a Ford Transis Chasis? Also, Don't Forget To Look For Our Upcoming "VISION RV" And "VISION 5" Seater!! Accepting orders NOW for VISION RV and VISION 5 seater, just ask us for more information! What Kind of Customizations Are Available? Too many to list here- but we will do everything possible to meet your particular needs and the needs of your horses! From leather seats, to Blue tooth, to complete cab customization The Equi-trek factory is very willing to adapt to your customization needs – and we have a full list of options in our brochure for you and your horses ! How Many Horses Can Fit Into A Van? What About LARGE Horses? The VISION is a compact and easy to drive two stall horsebox; offering a perfect solution to transporting horses without affecting the safety or comfort for both the horse and driver. Horses as large as 18 hands can ride comfortably with Equi-Trek! But I Have More Than 2 Horses? Will I Still Be Able To Get My Horse Van? Oh Yes. Our NEW Ford 650 can be customized to fit up to 4 and as many as 6 horses! How Long Does It Take To Get My Van and What Is Required? May take 4-6 months – depending on cab availability and FORD Transit build schedule. It will be well worth the wait because these Horse Vans are amazing… you will be the envy of all your friends! We will be glad to discuss with you the details for your purchase. 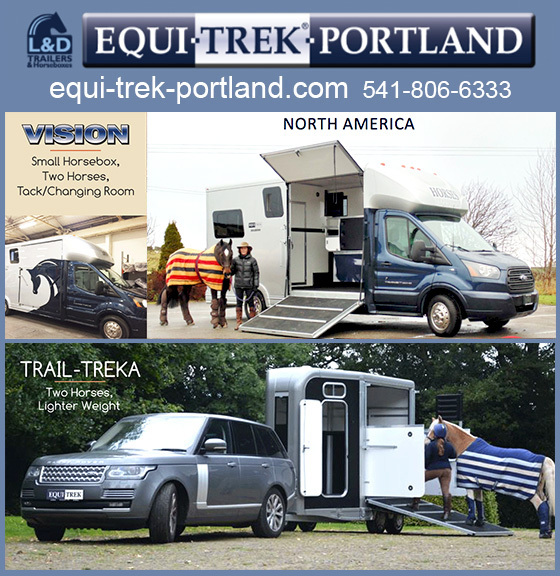 Call Equi-Trek Horse Vans at L & D Trailers Today! Our Horse Vans are amazing, but if you want a standard trailer, we can help you too— our trailer line up is almost as outstanding as our Horse Vans. We are horse people dedicated to serving other horse people! We would love to get a call, learn about your horses, your travel needs and we will spare no effort to serve you and your horses in a superior fashion in every way. Just pick up the phone— Dan and Lynn are happy to talk to you!